Don’t want to wait until tomorrow to find out the details on the new TAG Heuer Connected watch? Can’t say I blame you! If the new Connected is anything like the original, it should be a heck of a smartwatch. Let’s dive into what TAG Heuer plans to unveil tomorrow. UPDATE: You can buy it at TAG Heuer’s site. 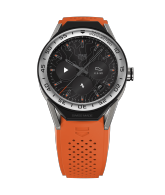 The new smartwatch from TAG is called the TAG Heuer Connected Modular 45, according to TAG’s own website that has outed the device early. That’s a mouthful, I know! The watch runs Android Wear 2.0 and features all of the specs you could want in a 2017 smartwatch, but it has an extra trick or two up its sleeve that allows the watch to become more than just a smartwatch. Yep, we’re talking about the “modular” part in the name, along with its Swiss background. The Connected Modular 45 sports a 45mm case that allows an owner to swap out the Connected (smartwatch) module for a mechanical module (specifically a 3-hands mechanical module or a tourbillon), which is where the watch will gain its “Swiss Made” certification, a certification that was absent on the original Connected, since it was only a smartwatch. TAG Heuer will expand that modular idea further by offering watch owners a range of materials, colors and combinations. They’ll also invite swapping of lugs, straps, and buckles. Some of the options include rubber straps (black, blue, red, white, yellow, green, orange, and electric blue), calfskin and rubber combo straps (black, grey, and light brown), ceramic straps, and titanium bracelets. The lugs will come in titanium, titanium with diamonds, titanium with 18K rose gold, and titanium with a matte black ceramic finish. Buckles will be available in PVD or titanium. To recap that idea, you’ll be able to take your Connected Modular 45 smartwatch and turn it into a mechanical watch with the click or two of a button, along with the lugs, strap, and buckle. Kind of cool, right? On the smartwatch or Connected side of things, the Connected Modular 45 sports an Intel chipset, water resistance to 50 meters (50ATM), WiFi, GPS, NFC (for Android Pay), AMOLED display, 4GB storage, Android Wear 2.0 (with Google Assistant), ambient light sensor, and battery life that should last beyond 24 hours. For those who own the original TAG Heuer Connected, understand that your deal that allows you to swap out your smartwatch (plus another $1,500) for a special edition mechanical version two years after purchase still stands. You can’t, however, swap out your original for the new Connected Modular 45. The new TAG Heuer Connected Modular 45 will cost $1,650 in the US. UPDATE 2: Everything is now official! See more images and details at this post.